Panettone the closest you can get to a national Italian Christmas food. And when you think that the concept of an Italian state is a relatively new one (Italy celebrated 150 years as a country in 2011) it’s no surprise that panettone is a relative newcomer too. This year’s panettoni on offer in the Rinascente department store in Rome. The cake was popularized in the 1920s by two rival Milanese baking companies: Motta and Alemagna. Although based on a traditional recipe Motta created an industrial version of the panettone which was taller and lighter than the original. Alemagna produced their own version and together the two marketed the innovation all over the peninsula. In the aftermath of World War II, panettone began to occupy the position it does today. It wouldn’t be Christmas without one. In the 1950s and 60s, there was a period of nostalgia in Italian cooking, during which a semi-mythical story of an age-old Italian cuisine was invented. As part of this, stories and legends of the panettone’s true origins were rediscovered, embellished, and sometimes invented. These include the one about the poor Milanese apprentice baker, whose girlfriend’s father rejected him as a suitor on the grounds that he was too poor. He promptly invented panettone, became rich and then happily married. Artisanal panettoni are often wider than they are tall; industrial ones the opposite. Other versions of the tale revolve around someone called Antonio nicknamed Toni. He invents the dish which gets called Pan di Toni (Toni’s bread). In some versions of the tale Toni is an apprentice who saves the day by inventing a last minute Christmas dessert after his master’s one is ruined. In others, he’s a priest who was famous for wearing a peculiarly shaped hat. Whichever you believe, the derivation of panettone seems to come from the slightly archaic word panetto which means ‘bread roll’. Adding –one on the end in Italian adds the meaning of ‘big’. So, a big bread roll. Today you can buy extremely cheap pannetoni, often from Motta or Alemagna (who are now owned by the firm Bauli) or really expensive, artisanal ones. Italians often give them as Christmas gifts to family and friends—particularly when paying them a pre-Christmas visit—or receive them from their employers. You usually never buy one for yourself as you will get given several during the period. Recently, luxury versions have appeared so you can make a bella figura when giving them away. Posh panettoni based on the Torta Setteveli. No discussion of panettone would be complete without addressing the ‘age-old’ question posed by all Italians. «Il panettone, con o senza canditi?» (‘Do you prefer your panettone with or without candied peel?’) Candied peel in Italy is a bit like Marmite in the UK. You love it or hate it. I’ve seen people literally picking the peel out of their panettone. A recent online survey produced a clear majority for those who prefer it without peel. However, a sizeable group said they didn’t care. 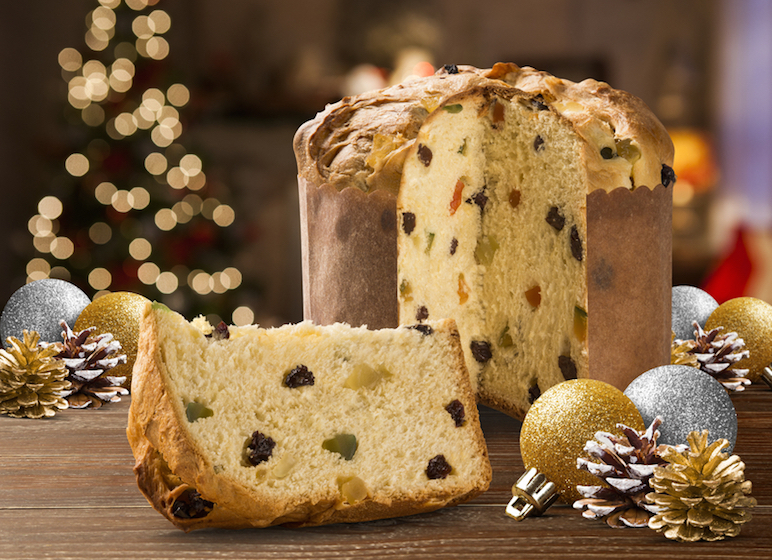 Do you prefer your panettone with or without candied peel? I’d love to know. Definitely WITH candied peel Luca!!! Which is your favourite brand? Have you ever made your own…..I have been thinking about giving it a go! I’ve never tried to make my own. I’ve investigated though and have found it takes a long, long time and people have to go to extraordinary lengths to make them not collapse. The problem is that the process for making them is really an industrial one and it very difficult to re-create at home. I’m not sure that it’s worth it. I have made a traditional recipe panettone (which is quite different in consistency) and a traditional Easter colomba too. No candied peel for your mother please Luca! Haha! That’s a bit different. I’ve never met anyone who likes the canditi but not the raisins. Well, I suppose that’s what makes the world interesting. It takes forever, right? How did they come out? It actually came out quite good. I used my ‘throwaway’ lievito madre. I posted a recipe for my panettone with figs, white wine and orange last December. I will probably make some again-but it was quite the production! Ooh! I’m checking that recipe out. Any suggestions for where to buy great panettone in Venice? In Venice they have another similar thing called Foccaccia Veneziana (which I think is even better). You can find them in all the pasticcerie but Emilio Colussi in Calle San Luca and Rizzo in Rio Terà San Leonardo are my favourites.